The Mississippi College Singers is a mixed-voice, auditioned ensemble that is the premier choral group of the department of music. Presenting a diverse repertoire of accompanied and unaccompanied literature, this choir has performed throughout the United States and abroad, with recent concert engagements in England, Italy, and Slovenia. In May 2008, Singers presented concerts in Leipzig, Prague and Vienna, including the famed St. Thomaskirche in Leipzig and St. Peter's in Vienna. A tour of South Africa in May 2011 included performances in Johannesburg, George, and Cape Town. Past performances include feature concerts at the annual meeting of the Mississippi Convention of American Choral Directors Association and Music Educators National Conference in 2002, 2007, and 2010, Mississippi Day at the Washington National Cathedral in April 2003, the 2004 ACDA Southern Division Convention in Nashville, and the 2008 ACDA Southern Division Convention in Louisville's Kentucky Center for the Arts. The choir received the prestigious invitation to perform on the program of the ACDA National Convention in Los Angeles in 2005. In January 2010, Singers returned to the Carnegie Hall stage for the third time since 2006 for a performance of René Clausen's MEMORIAL under the baton of Dr. Meaders. Singers made their debut in Lincoln Center in January 2012 with performances of Chichester Psalms by Leonard Bernstein and Mass of the Children by John Rutter. 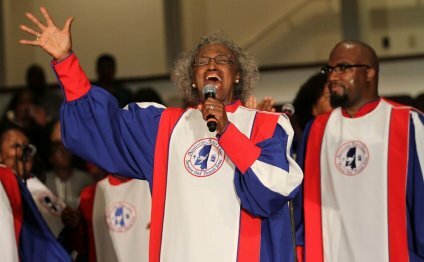 Speak It - Mississippi Mass Choir, "Declaration Of Dependence"
The Mississippi Mass Choir"The Birds!" Brooklyn Tabernacle Choir "More Than Enough"